Many months have passed since my last entry. Is there anybody out there still interested? I am taking a bit of a left turn as I move closer to not only observing Greece but perhaps understanding it as well. Three months from now, I will be living in Athens and teaching a film studies course to university students as a Fulbright Fellow. Although I will teach in English, I hope to occasionally communicate in the language of my students. 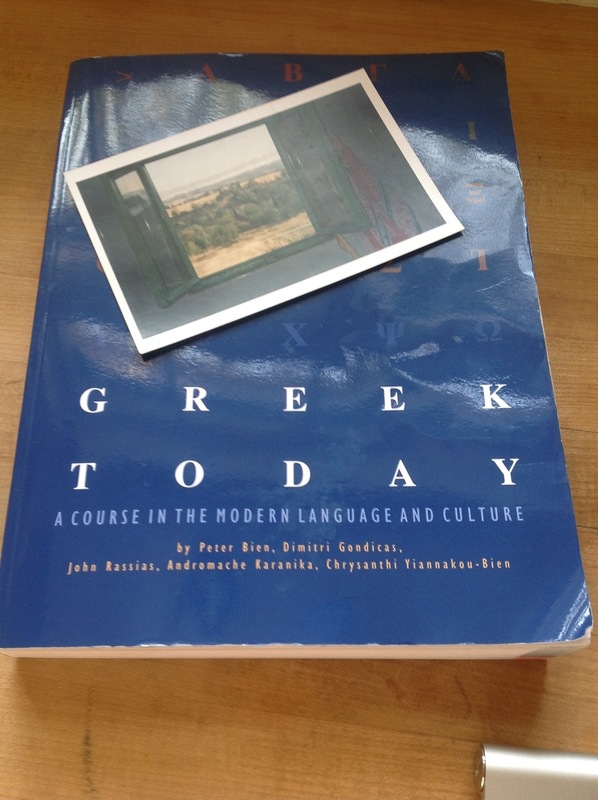 Therefore, I have become the student and am presently taking an elementary course in Modern Greek. The class has seven students, and I am the least accomplished. This situation comes as a great surprise: I have never had a failing grade in my life. I considered abandoning the class; however, I enjoy listening to Greek, learning to write in Greek, and reading in Greek, even if I only master forty percent. I find my response interesting. Who enjoys failing? Hearing and reading the language creates an excitement about the people, about their lives. Although I’m not successful, I feel a pride in knowing I can write a sentence in Greek. I can, even, read a sentence in Greek. Perhaps, I will be able to understand the newspaper Kastelliotika Nea sent to me every month from the village where my grandfather was born. I am one quarter Greek on my father’s side. Since 2001, I have made seven visits to the village. I could not speak Greek and the uncle who lives in my grandfather’s house does not speak English, nor did his wife, his sister, or his sister-in-law who were the family members I saw most often. I have younger cousins that speak English, but they are rarely there. Yet, not speaking didn’t seem to bother me. I felt at home in the courtyard of my great grandfather’s house, in the village square where we had souvaliki at night, tiny delicious pieces of marinated meat skewered on a large toothpick, grilled over charcoal and squeezed with lemon- a “meza” before the evening meal. The first time I went to Greece, I climbed into a closet every day and cried. The Greeks looked so cranky, pushed up too closely, and spoke with what seemed like aggression and abruptness. When I visited the village and was embraced by one relative after another, the two impressions didn’t jive. Now as I learn Greek, I start to understand. When I say “nai” that is “yes” in Greek as it sounds in class or on the CD I use, I hear my voice emphasize, not in abruptness or aggression, but in the joy of agreement, the pleasure of interaction, maybe even, some Hellenic pride.